Smaller spaces should always try to employ fixtures which are less obtrusive. 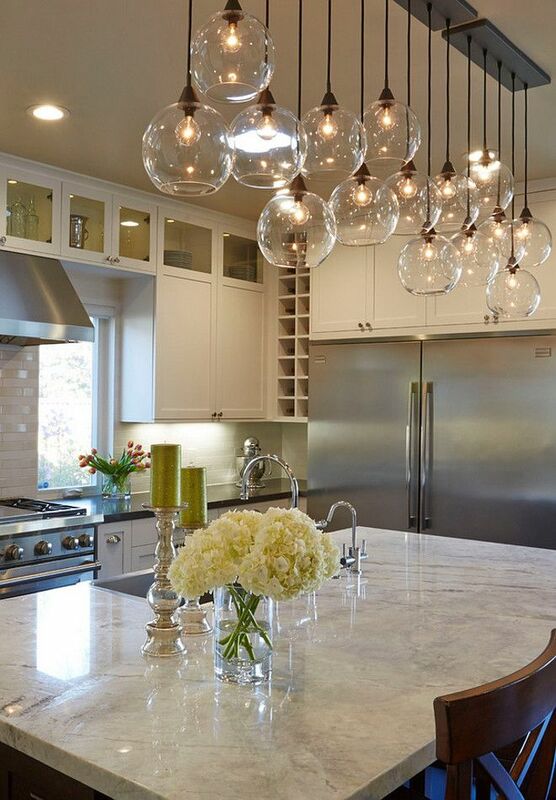 In this case, LED kitchen ceiling lights can be excellent options. They will bathe the environment in a scintillating glow and cast only a minimal number of shadows. This is particularly relevant if there are not many windows present within the room. It is best to avoid any fixtures which will detract from the space itself, so a minimalist approach is generally the best option. Outward DesignsModern kitchen fixtures offer much more than luminosity alone. They are able to convey a unique sense of personality to the viewer through the designs which can be incorporated. In other words, you should place a good amount of thought into the specific shape and style of your lights. There are obviously numerous options to consider during the buying process. For example, finishes such as chrome or stainless steel will be able to pick up and reflect ambient light; perfect to add a touch of class into the modern kitchen. Other variants including copper, brass or brushed metal may be better options if you are looking to espouse a more traditional or rustic appeal. Another point to mention here is that it can be a good idea to coordinate the styles of lights so that they will help to tie the entire room together. Similar themes and colour schemes will achieve this goal with only a minimal amount of effort. This is also a great way to maintain the visual balance of your kitchen.Small Accents to Make Big DifferencesIt is often the smallest of additions that can have the most pronounced impacts within a kitchen. Previous examples include under-cabinet lighting and plinth strips. Another interesting idea is to utilise what are known as toe-kick lights. More traditional environments will frequently employ chandeliers or pendant lights, as they exude a sense of inviting warmth. 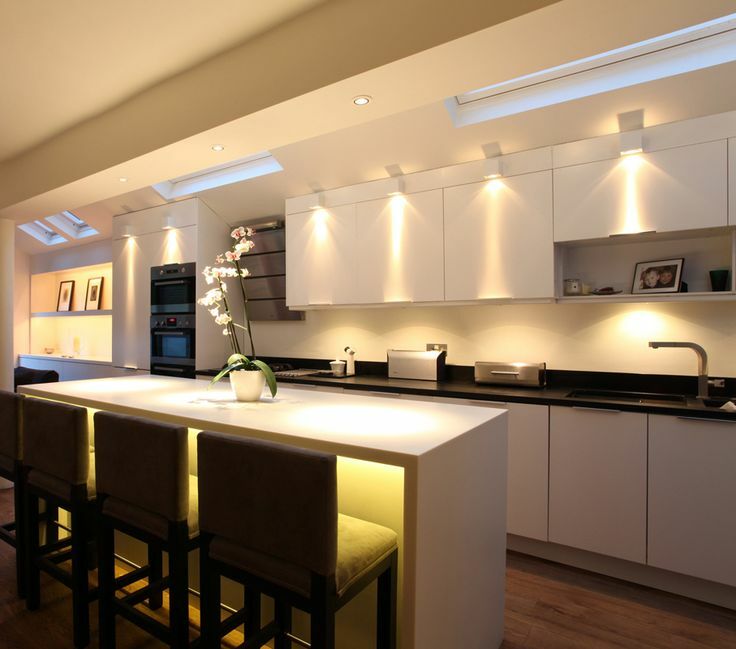 Strip lighting (such as the plinth variants mentioned earlier) convey a modern and streamlined ambiance. We should also take into account the size of the kitchen in question. In many ways, the type of lighting chosen can make or break this room. Massively reduced energy costs over time. A long lifespan when compared to incandescent or fluorescent variants. Less heat generation. Crisper light. A wide array of styles and colours. 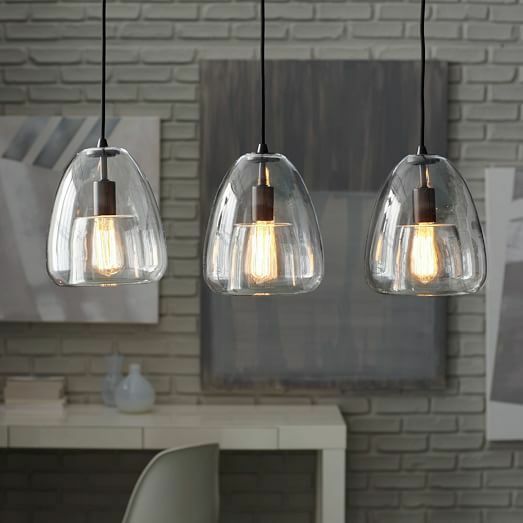 http://www.telegraph.co.uk/lifestyle/interiors/10015253/How-to-design-kitchen-lighting.html http://www.diynetwork.com/how-to/rooms-and-spaces/kitchen/tips-for-kitchen-lighting Want advice on bathroom lighting? Check out our “lighting ideas and tips for your bathroom” guide. Now that we have mentioned this basic concept, it is important to know the types of lights that you have to choose from. Let’s take a closer look. 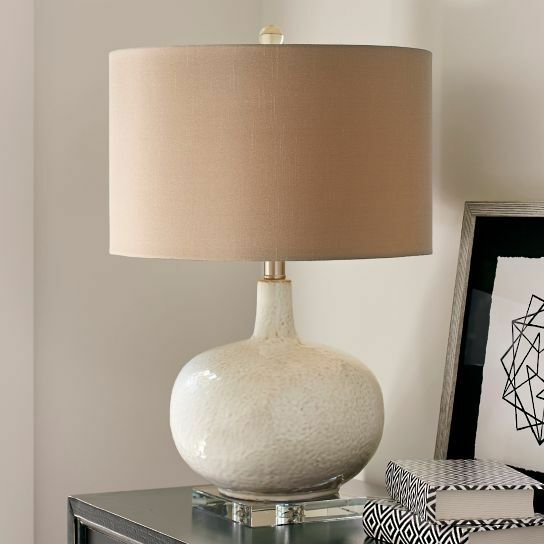 In rooms with lighter tones and a greater amount of reflectivity, you might not require as many lights. 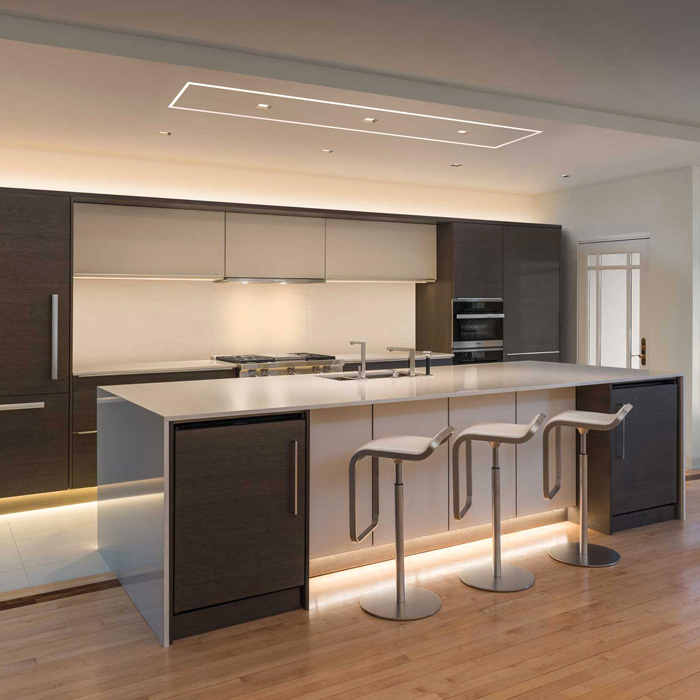 Darker environments or those which employ a natural wood cabinets and tables could instead need slightly more fixtures in order to provide a functional amount of luminosity.It might therefore be wise to adopt a more flexible approach. Many owners prefer to install a dedicated switch to control specific areas of the kitchen. Downlights, plinths and pendant lights can all be placed on a separate circuit. It is therefore possible to adjust the settings based upon the mood and the time of day. A second option is to add a dimmer switch. These switches will adjust the intensity of the lights, so you will once again be able to control their output. On the contrary, the dining area tends to work much better with muted lighting. Low-intensity lighting will set the proper “mood” and provide an extra sense of relaxation to your guests. The existing colour scheme of the room (light versus dark). The size of the kitchen. When illuminating kitchens you should consider the overall floor space rather than ceiling area as your kitchen cupboards can take up a lot of space. Beam angles. If your kitchen is relatively small (under 9MÂ²) then you’d be better off with a relatively narrow bean angle of no more than 40 degrees especially if you’ve got darker kitchen cabinets otherwise you’ll lose some of the light within the surfaces. For more information on beam angles, read our beam angle guide here. 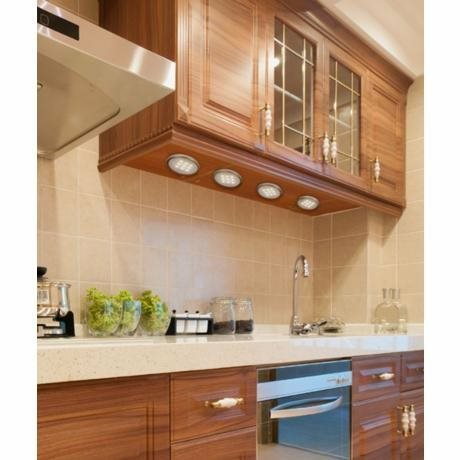 Kitchen cabinet lighting can refer to fixtures placed above or below these units. This option will provide a dramatic sense of depth while also helping to illuminate any work areas. 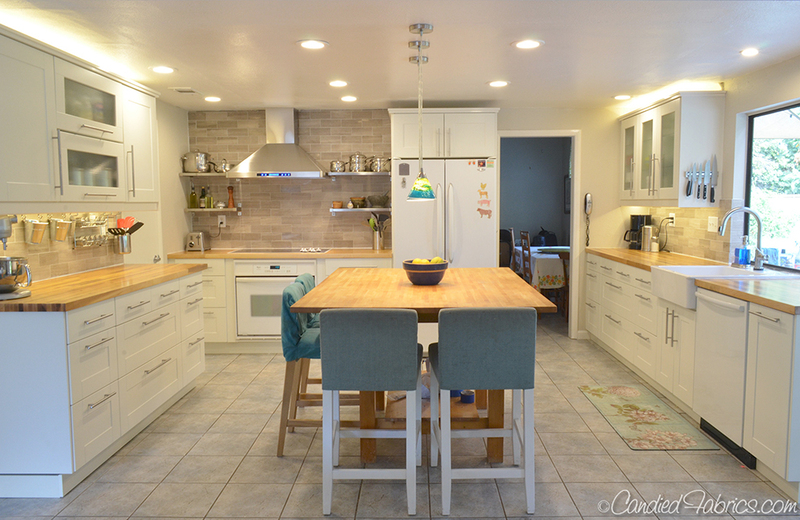 It is not uncommon for owners to use a “layering effect” so that specific rows of lights are able to be controlled by separate switches or dimmable under cabinet lights can be incorporated. Thus, the mood of the room can be quickly adjusted when necessary. As our name (www.downlights.co.uk) suggests, we specialise in providing downlights for any room in your home or business and we stock some of most premier lighting brands for the most affordable rates. If you are new to choosing downlights, you’ll soon discover that there are a huge amount of different options to consider. Check out our FAQs on “What Are The Different Downlight Types” and “GU10 Or Integrated LED Downlights” to start your downlights journey. 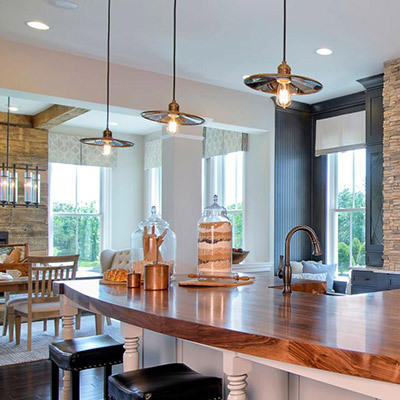 Luminosity aside, we also need to recall that the type of lighting chosen should always reflect the inherent style of your kitchen. For example, those who are trying to achieve a minimalistic appearance will often choose recessed overhead fixtures, as these will not impede upon the open “feel” of the room. LED strip lights are another variation of under kitchen cabinet light fixture that are proving popular with our customers. That’s because they are incredbily easy to install and can be changed to any RGB colour you wish (in the RGB version). These unique and functional lights are perfect for impressing your friends and family with. You might be surprised to learn that temperature plays an important role in regards to the colour of your LED lights. Most specialists measure this temperature in degrees Kelvin (ºK). Lower temperatures are associated with orange, yellow and red wavelengths. These are chosen by those who want to achieve a “warmer” effect such as a sunrise or candlelight. In comparison, a traditional halogen or incandescent light has a warm white effect, similar to 2,700ºK. Unlike downlights, which are recessed INTO your ceiling, spotlights are surface mounted ONTO your ceiling. Many people prefer spotlights over downlights as they are much easier to install and don’t require you to drill as many holes into your ceiling. 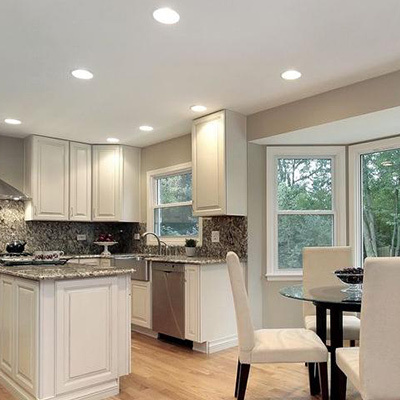 Kitchen downlights are very common options to consider in your kitchen. Sometimes referred to as “recessed ceiling lights”, downlights are installed flush within your ceiling, creating a flawless, modern aesthetic to your kitchen. 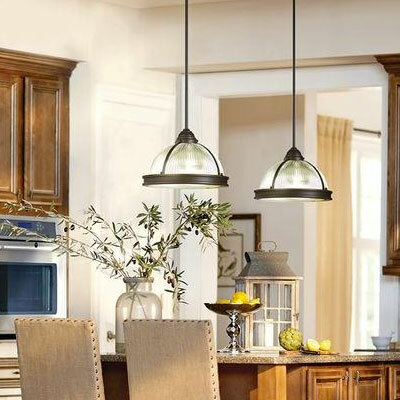 By installing in your ceiling, it helps to provide an all over light coverage perfect for the light levels needed in your kitchen as well as helping you avoid “ugly” hanging wires that you get with other types of lighting. Kitchen plinth lights are a final category. This scheme is generally used to accent a specific portion of the room such as the border of an island or the periphery of a set of cabinets. These unique additions provide a bespoke sense of ambiance and they may even allow some pieces to appear as if they are “floating”. As you may have guessed, typical plinth lights can be purchased in strips or as smaller LED marker lights and they are available in a wide range of colours and styles.